Now, I’m not fond of the chunky chocolate bar. The Chunky Kit Kat is usually far too… um… chunky. The biscuit is too biscuity and the chocolate isn’t thick enough. If I am going to eat chocolate, I want to be able to taste it. The usual two or four-fingered Kit Kat is gorgeous. Just the right combination of biscuity goodness and chocolatey flavour. Yummy. Now, the wonderful Kit Kat goblins have decided to treat us with some new flavours of Chunky Kit Kat (or, as some would have it, Kit Kat Chunky). There’s a mint version, which just sobs in the face of the far-superior Mint Aero, and there is a chocolate fudge one as well. 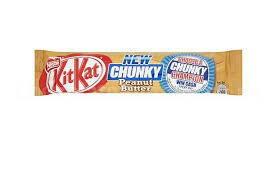 However, my personal favourite is the Peanut Butter Kit Kat Chunky. I loves me some peanut butter. In a sandwich (“Sammitch!”) or just on my finger (why do things taste so much better when eaten with your hands? An investigation must be due?) or even in a satay with some chicken. So, seeing the Peanut Butter Kit Kat in the shop t’other day, I knew I had to have one. The peanut butter flavouring is glorious and yet it doesn’t overwhelm all that good Kit Kat-y goodness. If I could make love to a chocolate bar, this might be the one. Ok, so this isn’t as articulate as something Giles Coren or Will Self would write about a gastro pub in North London but then they are snobby ponces so who cares? Bloody Will Self, coming in here, lording it over me and my Kit Kat. Stupid Giles Coren and his sister Victoria (actually, she’s kinda cute… I bet she likes a chunky now and again)! I wouldn’t let them try it, and I bet he’d ask as well. This entry was posted in Food, Norton and tagged Kit Kat, KitKat, Peanut butter. Bookmark the permalink.